I don't know much about art. Most of it looks like garbage to me. 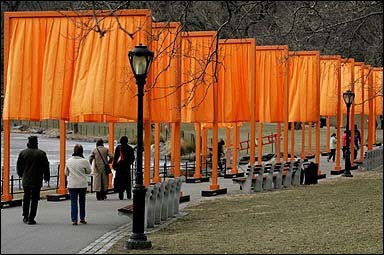 Today was the unveiling of "The Gates" in Central Park. I'm not exactly sure how it qualifies as art. It's quite spectacular to look at, and certainly adds a little extra flare to the Park, but to me it looks more like a belated tribute to Yushchenko's victory in the Ukraine. After all, it is orange. It actually kind of reminds me of one of the old Egyptian temple exhibits from the Natural History museum. You could walk through some of the chambers in the temple in order to get a feel for the structure. AP's story about the unveiling is interesting in that it quotes an 8 year old saying "It's art." Wow, thanks kid. I need to keep an 8 year old with me in case I do anything worthy of notoriety, just so they can frame it properly for the general public. Maybe I'm just jealous that AP won't hire me, but you tend to lend more credence to something being art when you quote an art expert, or perhaps someone closer to adulthood. I'm not debating the merits of this "piece," I'm just splitting hairs, really. It's more fun that way.